Kornatz, under the guidance of faculty advisor Ingrid Hess, set out to create a senior thesis project that could show students that studying math is more than just memorizing formulas or untangling word problems; it can also be interesting, engaging, and relevant. The final product—a Japanese-style comic book called Manga Math—is designed to be just that. As part of this design project, Kornatz had to study both pedagogy and math theory. “I researched mathematicians and their various discoveries until I picked Pythagoras and the Pythagorean theorem,” Kornatz says. She then developed a script, which she sent to several math teachers who reviewed it along with their students. Once she gathered all the feedback, she could then begin to develop her design approach. “I lived in Japan for three years because my father was in the Navy,” Kornatz says. “I read a lot of manga and realized the versatility that it has in Japan—from picture books for toddlers to instructional manuals for businesspeople. The word manga, literally meaning "whimsical pictures,” first came into common usage in the late 18th century with the publication of picture books by Japanese artists. It now refers to the Japanese version of the familiar American comic book. Manga exploded in popularity in the 1950s and also has influenced the development of anime, or Japanese-style animation. 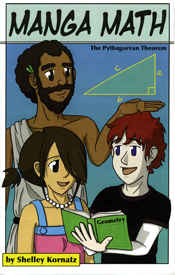 In Manga Math, Kornatz uses a modern-day high school storyline that helps students realize that math can be applied to their daily lives. She includes a biography of mathematician Pythagoras to help her readers understand how the theorem was developed and incorporates hidden practice problems throughout the book so that students can apply what they’ve read. The book has already made an good impression on the faculty in Notre Dame’s Department of Art, Art History, and Design: Kornatz was honored with both the Radwan and Allan Riley Award for Design and the Efroymson Family Fund Emerging Artist Award at the 2010 BFA/MFA Candidates’ Theses Exhibition. Of course, if there is enough interest, she adds, she is definitely willing to go back to her drawing board.